Terrifying because it's a Halloween themed horror movie pack, y'see? Joe Danger 2 is set to get spooky, when the Undead Movie Pack is released later today. Although, I don't know about Hello Games, but most of the horror films I've seen don't involve a jolly fat stuntman riding a motorbike past cheerily sentient scenery, while a director gibbers merrily and a disembodied voice sings a melodic "DAAAANGER". It's possible that I've been watching the wrong movies. 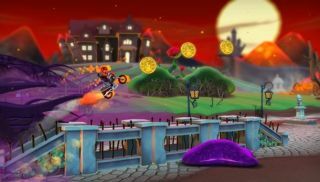 "This add-on for Joe Danger 2 features 15 spine-chilling new levels across three complete tours with six ghoulish new characters," explains the trailer's description. "Hunt brains as Zombie, sabotage dark rituals as the Vampire Hunter, and escape the creeping darkness as Pumpkin Head! Claim skulls as the Rider, run the gauntlet as the Chimpanzombie and tame the dreaded Werebear!" If you've not yet picked up the side-scrolling stunt platformer, a corresponding sale is also planned is now live , reducing both Joe Dangers by 75%. For more details on those, check out the Hello Games blog .